Individual or Team Sports for Kids? As children become more proficient in their selected style of martial arts, their confidence gets a big-boost. They become more self-assured and confident. Their Sensei’s (Teacher’s) encouragement goes a long way to help them achieve this goal, but the confidence level will extend far beyond the Dojo (Martial Arts Studio). I know that this might seem like a stupid reason at first, but you’d be surprised how much belts and ranking help build your child’s confidence and their desire to succeed. For the uninitiated, most Martial Arts styles use a system of Colored belts to indicate the knowledge and skill levels of their practitioners. In many cases the first belt promotion can be attained in as little as a few weeks and when children obtain that first belt, it shows them that with the right motivation, they can succeed. One belt is always not enough, once a child passes one belt test he or she is already thinking about the next one. Belts are a great way to help children track their progress and motivate them to strive higher. The mantra of any martial art is ‘practice makes perfect’ There is constant repetition in drills and practices with emphasis on details and rhythm. Kicking and punching are practiced ad nauseam; throws are repeated over and over. Even while sparring or competing – where a martial artist shows how creatively he or she can apply their well-honed skills – there are still rules and protocols to be followed. All of this teaches children to respect one another, their opponents and colleagues, and how to play games fair and square – lessons that follow them in their non-Martial Arts lives. It also teaches them the benefits of frequent practice, and the patience to get there (Remember the Karate Kid and Wax On/Wax Off?!). In basketball there are only five starters, yet there are seldom only five people on a team – which means that someone has to start each game on the bench. This applies for most team sports as well. In team sports there are also positions, and each has connotations. Although teamwork and sportsmanship are emphasized in team sports, at some point you’ll need to explain to your child why they aren’t a starter or why their stuck in right field batting 9th instead of playing first base and batting cleanup. In the martial arts, however, each child’s success is based on his or her own individual merits. Yes, your kid may not be the most winning Judoka in his Judo class, but that will be because he tried and lost, and not because he wasn’t good enough to make it off the bench. Your child will also not be stuck on a ‘bad team’ as her own ambition will help her achieve success. Knowing that their own ambition and abilities will drive them to succeed, will lessen the chances that your child will say to you ‘I hate this sport’. Since each child has an opportunity to play, there is also no scapegoat to blame if they don’t win, and the opportunity to do better at the next tournament. I am sure that while many of you would consider martial arts for their sons, not nearly as many would consider it for their daughters. However the martial arts are one of the few sports where both boys and girls can play together. There are also tremendous international opportunities in Women’s martial arts as well. Your daughter’s red belt will not be any easier for her to attain than your son’s red belt will be for him. It also gives brothers and sisters an opportunity to practice together and learn from one another as well (not to mention the convenience of having all of your kids in one place at a time). My college Judo coach, Sensei Maureen Braziel, competed for the US on an international level, and she is a great coach and an excellent Judo practitioner, in addition, one of Israel’s few Olympic Medals, a Silver Medal, came from Yael Arad in the women’s Judo competition in 1992 in Barcelona. Maybe your daughter will become an Olympic Judoka too some day? The typical 2-hour martial arts class will often be comprised of warm-up calisthenics, teaching and practicing of moves and possibly some sparring. The warm up and practice comprise the bulk of the time, and for that time your child will be constantly on the go – stretching, crunches, punches and kicks. The workout each child gets will not only assist in the natural development of his or her muscles, but also help them build stronger Cardio-Vascular systems. Even in the most active of team sports such as Basketball, Hockey, or Soccer, children don’t get that much of a workout simply because they generally don’t play the whole game and even if they do, there are still breaks in the action. The first thing the parents of (even slightly) mischievous children think about when they send their kids to martial arts class is: “Is my kid going to use this to hurt others?” Although this is a legitimate concern, it is always addressed early by instructors who remind students that the techniques they learn in the dojo stay in the dojo (except in self-defense), and shouldn’t be used to bully people (unless your Sensei is John Kreese from The Karate Kid). As children learn the ropes, they will learn to respect their newfound strength and techniques. They will also gain a disdain for bullying as well. Just like in team sports, Judo is all about competition. Competition is great for kids to test their skills and show their progress. Unlike team sports, the loser can’t really blame anyone beyond his or herself. But then this gives them a sense of respect for their opponent, as well as motivation to do better the next time. Unlike team sports, which treat each game as a leg in the entire season, each tournament is a fresh start, and it is seldom that you get only one match (even in the Olympics where there is a single-elimination for the Gold and Silver medals, there is a second-chance round for those who have lost their first matches for them to be able to win a Bronze). Many martial arts schools offer classes for both adults and children. While most do not run those classes simultaneously, they are usually one right after the other. This means that you can watch your children workout, and then they can watch you. If you have the proper space for it, you can practice with each other at home, and learn from one another. This will give you a special activity to use as a bonding tool with your kids. You can also become physically fit together. Granted, you can play Basketball in your driveway and have a catch in the backyard, but it is just not the same as working on your kids’ roundhouse kicks in a group. Many team sports, especially those primarily played outdoors, or in specific weather (think Skiing, Hockey) are seasonal. The Martial Arts are a year-round affair. As I mentioned above, a bad tournament only puts you out until the next tournament, and your exercise routine remains constant the entire year. Having this consistency also helps build upon discipline, and allows children to progress very quickly. 12. They will exercise their minds too. While all martial arts teach you to fighting strategies, Judo really teaches much more. While learning Kuzushi (the art of breaking your opponents’ balance) and throwing techniques, they learn Mechanical Physics. Combination techniques and follow-ups teach them improvisation, and finally, they learn a lot of Japanese too (I’ve already taught my two-year old how to count to ten in Japanese). In most other forms of Martial Art, the language is limited to the words: Sensei (teacher) Hajime (Start) and Matte (Stop). 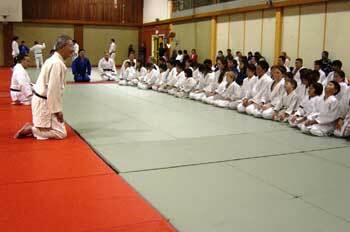 Kano Sensei (Dr. Jigoro Kano, the founder of Judo), in his teachings, emphasized the concept of maximum efficiency. This is evident, as the crux of many Judo techniques is not necessarily brute force, but using your opponents’ movements and strength against him or her. While physical strength and size are important, mental strength is probably the most vital factor in competition. When you’re using your opponents’ moves against him or her, timing is everything. Many of the throws in Judo will simply not work if you don’t time them correctly. Feet, hands, hips and head all need to move in fluid and exact timed motions to properly execute a throw (which is why an Ippon – or full point – is so hard to achieve in competition). As your child practices he or she will learn more complex throws and, in turn, will demonstrate better reflexes and coordination as a result. If a Karate practitioner travels to another city he or she might have a hard time finding a dojo to work out in that has the exact same style and philosophy as their home dojo. Not so for Judoka – because the techniques and principles are practically universal. A New Yorker can go to California for a week, and still find a place to play. There are over a hundred member countries in the International Judo Federation, and at the Olympics, the competing Judoka came from places as diverse as Cuba, Israel, and Kazakhstan as well as from the expected countries like Japan, USA, Russia and the France. Although the styles of teaching and ranking and promotion standards vary slightly from country to country – Judo is Judo is Judo. Which helps your child stick with it, even into adulthood, as it will never be hard to find a dojo to train in, and the material will always be the same even if the location is not. Hopefully I’ve piqued your interest to the point where you are thinking where to start investigating the Martial Arts for your child. Martial Arts classes are given at many community centers, and schools are also listed in the phone book. However my advice is that you go online for suggestions on dojos and instructors as well as answers to any questions you might have. This site, Judoinfo.com, and its sister, JudoForum.com, are two great places to start investigating the sport of Judo and getting your questions answered. If you use Google, Yahoo, or other Internet search engines a simple search for, say ‘Karate Forums’ or ‘Jiu-Jitsu information’ will probably point you to similar sites for those arts. If you are skeptical about making a commitment to a Martial Art for your child, you should definitely talk to the Sensei of the school you are interested in sending them too. Many schools will offer trial options, especially for younger kids, so you don’t need to make a huge financial commitment up front if you feel that it isn’t for your child. In conclusion, Martial Arts are a wonderful alternative to team sports that will provide your child with not only an excellent physical workout, but also act as a vehicle to provide them with a mental and emotional workout as well. Yonah Wolf has been practicing Judo on and off for the last decade, and has recently returned to the sport after a long hiatus. He currently holds the grade of Sankyu (the lowest grade of Brown Belt) and hopes to get his Black Belt before his two toddlers are old enough to play. The original version of this article appeared on JewCentral.com.